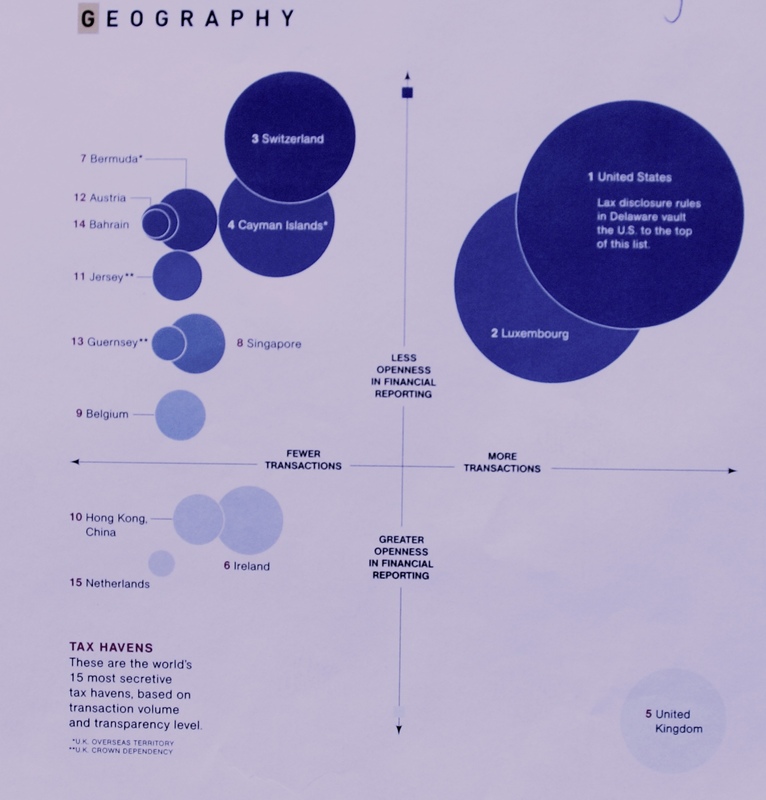 National Geographic magazine has picked up on our Financial Secrecy Index and published a fascinating graphical representation of the top 15 secrecy jurisdictions according to opacity and scale of operation. The horizontal axis on the chart below shows scale of operation. The vertical axis represents opacity. As you can see, the United States tops the index by virtue of the scale of its offshore financial services activity and the opacity of laws at federal and state level (Delaware was cited in the 2009 index as an example of state level opacity). Luxembourg comes second due to the sheer scale of its offshore activities, even though Switzerland (ranked third on the index) is more opaque. Interestingly, the City of London, which has the largest offshore financial sector in the world, ranks fifth because it is comparatively transparent when set alongside the other main players. That does not let London off the hook, however, since if you look closely at the top fifteen shown on the chart below you will note that half have historic links to the British Empire (Bermuda, Cayman Islands, Guernsey, Hong Kong, Ireland, Jersey, Singapore). In practice, City firms are happy to shunt their really dirty stuff offshore to the Crown Dependencies and Overseas Territories where they can more easily bypass political and regulatory processes. As the National Geographic article notes: "some free marketeers say havens improve banking competition and economic growth. Yet the U.S. Treasury loses an estimated $100 billion a year to them." And, citing TJN's John Christensen, they point out that the biggest losers are the poor: "A 2009 study found that developing countries forfeit up to a trillion dollars a year" due to the activities of secrecy jurisdictions. This is a fascinating insight into the emerging new geography of corruption.